Walking into the Pottsville Middle School gym, I’m flooded with nostalgia. As a visiting player during my pee-wee basketball years, at least one Saturday every season I would walk in to that gym ready to leave everything on the court. And we’d usually get drubbed. Now the gym is filled with rambunctious fifth graders shooting and dribbling as they wait for practice to start. They look like… well, like kids from my perspective as a high school senior. It’s hard for me to remember being that small. I spot a tall, lean man in sweatpants and a baseball cap wading through the ball-bouncing youngsters. Of course Monty’s family supported his athletic endeavors. His dad even coached Monty’s peewee teams. From there Monty moved onto junior high and high school Apache teams, a solid player, until he graduated in 1992. Shortly after his graduation, he was asked to help a younger player. And in that mentoring Monty found a sense of satisfaction very similar to what he felt during his playing days. The next step was teaching kids just beginning to play basketball as a pee wee coach himself. Through his dedication to the game, and most importantly to the kids, Monty has earned a reputation as one of the most caring, passionate, and effective coaches in the River Valley. This is Monty’s second year coaching his current group, although, really it’s two groups — both the boys and the girls teams. Using a somewhat unconventional method, he started practicing the teams together and it has some benefits. “It’s made the girls a lot tougher,” Monty says. It’s also fostered a sense of community on the team — every player helps their teammates because they know that ultimately it makes the teams stronger. During my basketball years there always seemed to be some sort of drama on the team, and practicing with the boys would have been counterproductive. But here it was just about learning and enjoying the game. Monty’s coaching style seems to be the antidote to drama. Monty expanded his mentoring and began coaching a travel basketball team in 2005. The team was made up of kids from his peewee teams and players from other schools around the area. “They meshed because they played against each other for four years,” Monty says. Still, Monty had concerns about the chemistry. “I didn’t think it would go as good as it did but it did.” Spending a summer together was a learning and bonding experience for both Monty and the players and it led to enduring relationships. “When they played high school ball, I got to watch them play against each other, and the whole time they’re sitting there smiling at each other,” Monty says. 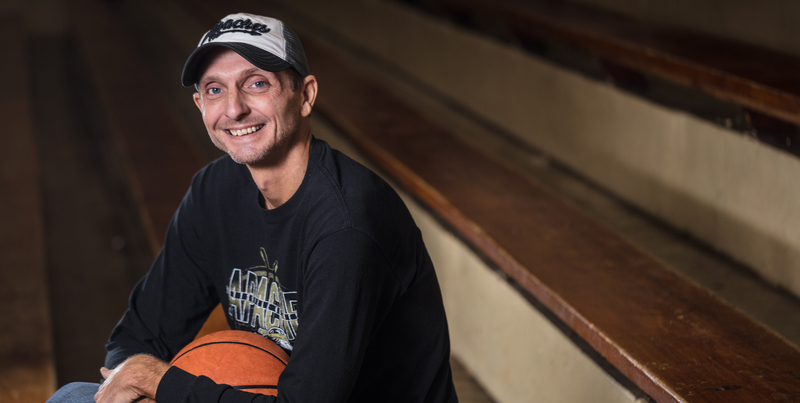 In his 27th year as a mentor and leader of young athletes — maybe one of the most under-appreciated jobs in any community — a lot of his time is spent in school gymnasiums, and he has career goals as a basketball coach. “I’d love to coach in a state championship game and win it,” Monty says. But coaching pee wee and summer league basketball is a volunteer position. Outside of the occasional free hot dog and Coke at the ballgames, the chance to share his love for the game is the only reward. I ask Monty how he makes a living, what’s his real job, and and he rattles off a short list of occupations he’s had: driving trucks, installing phone and intercom systems, cutting and selling hay, and owning cattle. “That’s about it,” Monty says. “Basketball takes up a lot of time.